Well, as is always the case, the excitement that led up to the Oscar nominations gave way to some disappointment when the nominees were finally announced by Chris Hemsworth (Rush) and the new Academy of Motion Picture Arts and Sciences President Cheryl Boone Isaacs early this morning. Click here for a full list of the nominees or just scroll down to the bottom of the page. 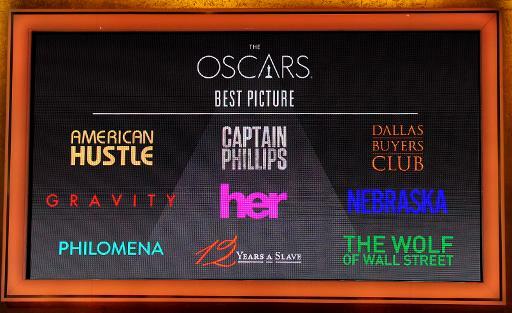 My initial thoughts are that the nominations this year got things mostly right. The 9 nominees for Best Picture represent a diverse crop of offerings from Hollywood…all movies that the Academy would award the trophy to had they been nominated in a lesser year. Omissions like August: Osage County and Saving Mr. Banks weren’t totally unexpected but I think the presence of Her and the Dallas Buyers Club were nice surprises. I’m happy that Oprah Winfrey didn’t wind up with a nomination for her work in Lee Daniels’ The Butler. Sally Hawkins in Blue Jasmine most likely edged her out for the nomination…and deserved it more. A nomination for Winfrey would have been Hollywood bowing down to her once again. She already has an honorary Oscar and maybe she’ll find another project that can give her as strong as what she did in The Color Purple…for which she probably should have won the Oscar. Speaking of Blue Jasmine, I’m a little surprised that it didn’t land a nomination for Best Picture…but the race was a strong one and I think people remember Oscar nominee Cate Blanchett for her work more than they remember the picture as a whole. It’s a damn shame that Daniel Brühl’s performance in Rush wasn’t recognized with a Supporting Actor nomination. Ditto for James Gandolfini in Enough Said. I didn’t think Bradley Cooper and Jonah Hill delivered the kind of performances that would have seen a nomination come their way over Brühl and Gandolfini. Cooper, in particular, made my skin crawl with his overabundance of actor-y moments. Hill’s fake teeth probably should share the nomination with him. People may say that Amy Adams narrowly beat out Emma Thompson’s wonderfully tightly wound performance in Saving Mr. Banks for a nomination but make no mistake….Meryl Streep in August: Osage County took Thompson’s spot. I love Streep, don’t get me wrong, but her performance was Streep at her Streep-iest…and nothing that we haven’t seen before. Thompson had a more difficult role (and weaker material) to navigate. Personally, I would have taken Christian Bale and Leonardo DiCaprio out of the Best Actor mix and replaced them with Tom Hanks and Robert Redford…two veteran actors that locked on to their roles to fantastic results. Bale and DiCaprio also ruled quite well in their films…but I was partial to what Hanks and Redford showed me that I didn’t know they had. Dallas Buyers Club is gaining major steam in the home stretch of award shows mostly notably seen in Craig Borten & Melissa Wallack’s nomination for Best Original Screenplay knocked Joel and Ethan Coen out of the running for Inside Llewyn Davis. Inside Llewyn Davis also failed to get a Best Original Song nomination, with producer T-Bone Burnett on board I would have thought “Please, Mr. Kennedy” would have found its way on the list. I was bummed that “Young and Beautiful” from The Great Gatsby wasn’t nominated either, especially because it’s haunting melody was weaved so well into the film. Still, none of the nominees can top last year’s winner, “Skyfall” by Adele. The Lone Ranger getting nominated for Best Visual Effects over Pacific Rim is really a shame. Pacific Rim may have been a terribly dopey movie but it looked incredible. Still, Gravity is the clear winner here so in the end it wouldn’t have mattered. I thought I had a better bead on the nominees for Best Documentary Feature. I’m disappointed that the excellent The Crash Reel didn’t land on the list but happy to see the crowd-pleasing 20 Feet From Stardom get the nod. Now I have some work to do to see the other nominees. Best Animated Feature likes to throw a curveball into the mix and it’s nice to see Ernestine and Celestine make the list over larger studio fare. Haven’t seen it yet but something different is always welcome. Interesting to note that while The Grandmaster was favorited to land a Best Foreign Film nomination, it didn’t get one…but did get on the list for its impressive cinematography and gorgeous period costumes. The more I look into these over the next few days and weeks I’m sure I’ll change my mind about certain performances/pictures but for now…I’m just happy I know what I have to see before the big day arrives on March 2. How about you? What’s on your list to see? I’d say Jonah Hill would need to share his nomination with his fake teeth and his fake thing-without-teeth.